This year the PCC have decided to support the charity “Isabella’s wish to walk”. Isabella was baptised here with her twin sister last year, Isabella has Spastic Diplegia CP. Her family need to raise money in order for her to have the surgery and physiotherapy she needs so that she can have the opportunity to walk and play with her sister and brother. Please give generously. God bless. Did you know, if you're shopping online you can nominate St Mary's Church, Broomfield to receive a charitable donation - and it won't cost you anything! Click here to visit easyfundraising on your way to your usual web page, and start shopping! 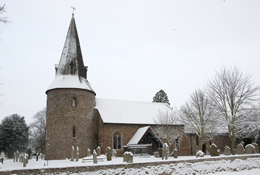 The Parish Church of Broomfield is a lively and welcoming church community. There has been worship in this place for many centuries and we are proud of our ancient historic building with its stunning round tower, beautiful peal of bells and extensive church yard. Alongside the history however we are a vibrant worshipping community. All are made to feel welcome whether you attend regularly or if you are just visiting. Our worship is broad ranging from quiet Holy Communion services based on the Book of Common Prayer to lively and loud family services with Puppet ministry and instruments for the kids... and everything in between. We hope that you would like to come and join us as we seek to engage with God in a very real and dynamic way today.